Immobility and fusion of a joint due to disease, injury, or a surgical procedure. Ankylosis of the cricoarytenoid joint may be seen after traumatic dislocation, or in rare instances of the disease rheumatoid arthritis. 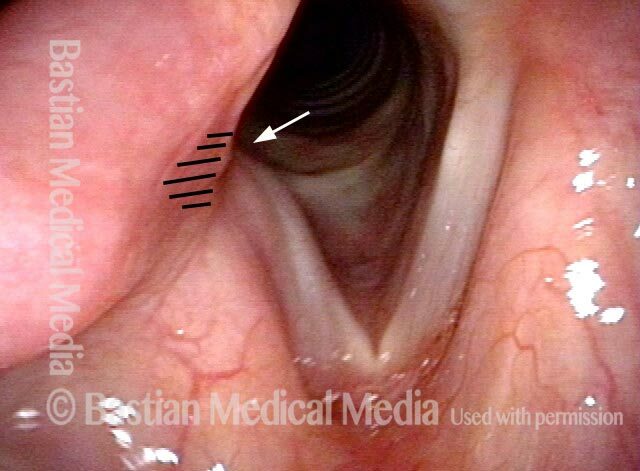 Right vocal cord (left of photo) immobility in young woman who was intubated more than 20 years earlier, at 5 months of age. Voice has been weak and air-wasting ever since. Both vocal cord paralysis and vocal cord fixation are potential complications of intubation: In this case, which is it? In this distant view, one can already see a “divot” in the right posterior cord (left of photo) that is not seen with any of the permutations of vocal cord paralysis or paresis. The area of shading also suggests an area of scarring where the tube traversed the medial arytenoid cartilage. Under strobe light at closer range. As the cords begin to oscillate, one can again see the scarring of the posterior right cord and arytenoid face. In addition, there is no flaccidity of the right cord (left of photo) such as would be seen with a neurogenic cause. The problem is vocal cord fixation, not paralysis. This entry was posted in Multimedia Encyclopedia and tagged Disorders, Miscellaneous voice disorders, Photos, Voice & other larynx disorders by admin. Bookmark the permalink.